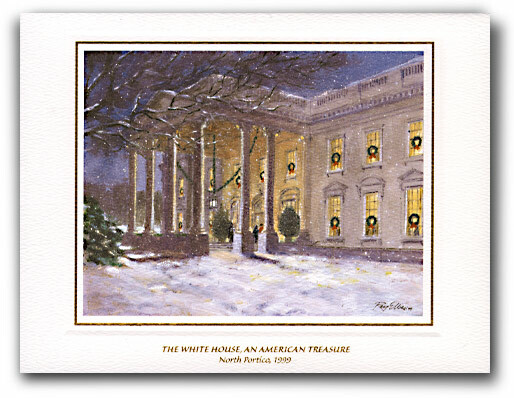 The 1999 White House Holiday Card features a watercolor painting depicting the North Portico. The White House was chosen as the subject of President and Mrs. Clinton's holiday card to pay tribute to a true American treasure. The card was created by artist Ray Ellis of Martha's Vineyard, Massachusetts. Mr. Ellis is known for his exquisite watercolor and oil landscapes. He designed the 1998 White House Holiday card featuring a watercolor painting of the State Dining Room. The inside of the card reads: "Our family wishes you and yours a blessed holiday season filled with treasured memories of past traditions and joy and peace in the new millennium." It is signed by the President and First Lady and embossed with the Presidential seal.